I'll be at this event with a selection of my new and summer sale jewellery. "make your own" personalised necklace or bracelet at pocket money prices.I'll be at this event with a selection of my new and summer sale jewellery. 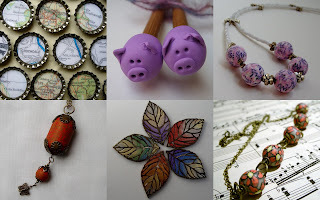 I've decorated the ends of these knitting needles with polymer clay, in a variety of patterns and cute little piggies and sheep! Cutsie!!! Just about to list these new hanging hearts on Etsy! Made from polymer clay, with gold lettering, these beautifully embossed hearts have gold lettering with inspirational words. They hang from cotton cord. I could also make these with a word or name of your choice...within reason...hearts are only so big...infact, they're approxmately 6cm. 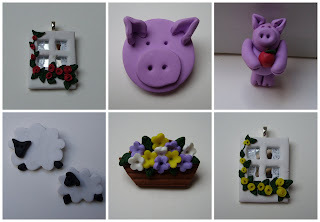 I've updated some of the first things I ever made in polymer clay, which was a quite a few years ago. So here we have tiny window pendants with yellow or red roses trailing round the frame, white lace curtains and a mirror at the back. A silver aanraku bail is attached to hang from a chain around your neck or a short cord if you wish to hang it on your wall. I love pigs and sheep and these are adorable worn on your coat or cardigan. Or pin a basket of flowers to your collar if you prefer. 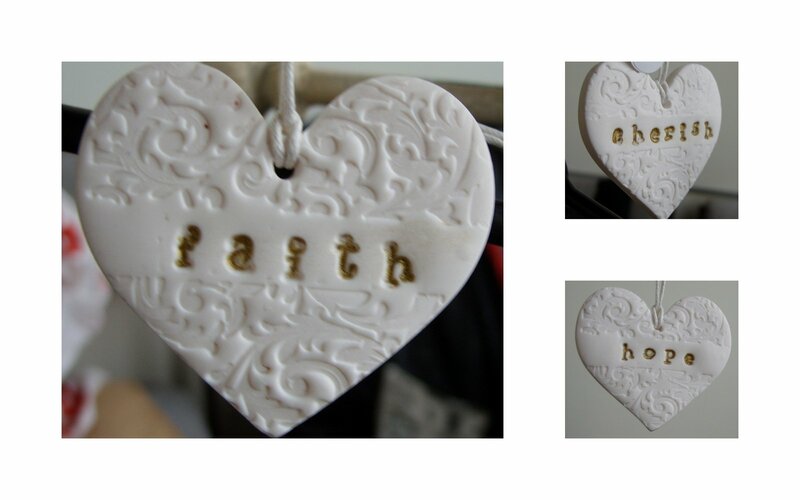 An example of my new "Pure and Simple" pendants featuring inspirational words, such as faith, hope, cherish, love, wish etc. 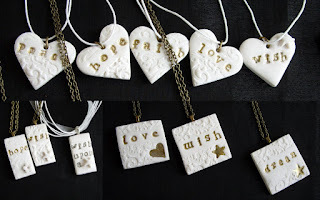 Some are embossed with a filigree design, some have a tiny daisy, star or heart added and the square ones have a shape cut out which has been filled with gold. Shapes measure approximately 1 1/2" in length. 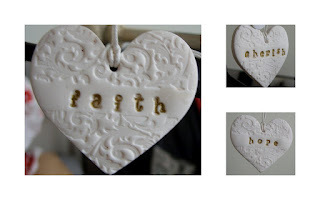 An example of my new "Pure and Simple" hanging hearts featuring inspirational words, such as faith, hope, cherish, love, joy etc. The hearts measure approximately 2 1/2 " and are embossed with a filigree design and then stamped with gold lettering. They hang from white cotton cord.